My machines do not know whether they want to be considered art. All they know is that they want to function without interruption, and they are not bothered about where this happens. Usually they produce tangles of lines that can stream out mile upon mile before your eyes. They get along with your phone and with e-democracy, which they use to hook up with the public, but they cannot stand hi-tech. What they have in common with new media art is the fact that we are part of an epoch-making technological upheaval whose implications need to be understood. However, they have nothing to do either with digital activism or with technological experimentation as an end in itself. They also have little to do with virtuality. The flow of images they have been generating without interruption for twenty years is non-material but real, and it has an existence independent of the observer. They are self-operating devices, machines programmed to operate at a minimum, in an abstract, empty way, reduced to the essence. Arguably this makes them similar to conceptual research, although even this definition may seem inadequate, since here the medium and the theoretical object of the research are the same thing – and this opens up a new situation. The book brings together some conversations about art and the new technologies, conducted between 2004 and 2011. Some are published here for the first time, others have already been published, though not in English. In the main section there are conversations with curators and art historians (such as Simonetta Lux, Domenico Scudero, Terri C. Smith and Sandra Solimano) about my work as an artist, and also included are extracts from critical essays and documentation relative to some of my installations. Another section of the book is comprised of some conversations that are not about my work, but which offer a broader perspective on the relationship between art and technology; involved in these other conversations are several leading players in the fields of research and experimentation, namely, Roy Ascott, Mario Costa, Eduardo Kac, Richard Stallman and Gerfried Stocker. My special thanks go out to all. 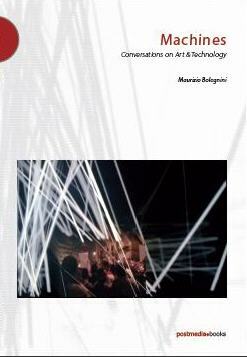 The book brings together some conversations about art and the new technologies, conducted by Maurizio Bolognini between 2004 and 2011. In the main these are conversations with curators and art historians (including Simonetta Lux, Domenico Scudero, Terri C. Smith and Sandra Solimano) about Bolognini’s artistic work. These conversations bring out an interesting and unusual angle of vision on neo-technological art, which the author describes as a vast and heterogeneous area of research, part of which appears to be closer to the art system and to conceptual art. By continually referring to his own work Bolognini is able to look at this area of artistic research, as it were, from the inside, and to offer a view of it which is both concrete and extremely engrossing. Another section of the book includes some conversations which offer a broader perspective on the relationship between art and technology. Involved in these conversations are several leading players in the fields of art research, art theory, and technological activism, including Roy Ascott, Mario Costa, Eduardo Kac, Richard Stallman and Gerfried Stocker.